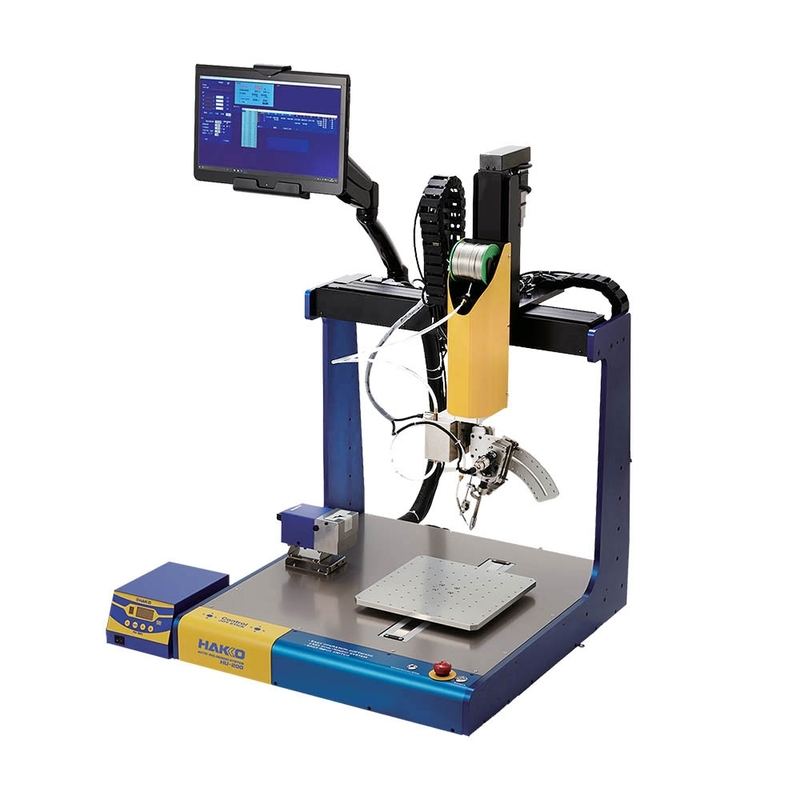 With the power of the FU-601, the easy robot programming and the reliability of Hakko products, the HU-200 offers a solution to almost any soldering project! 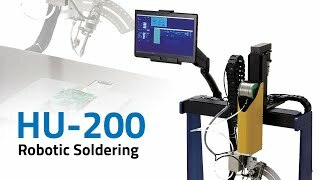 The Hakko HU-200 Robotic Soldering System is an expansion of Hakko’s robotic soldering solutions first built by the FU-Series soldering station and feeder for automation. The HU-200 is a 4-axis system and has a large working envelope of 400mm x 300mm with the top speed of 800mm/s and boasts a repeatability of 0.01mm. An absolute encoder enables the machine to monitor the location of the soldering iron at all times, ensuring a high level of repeatability. 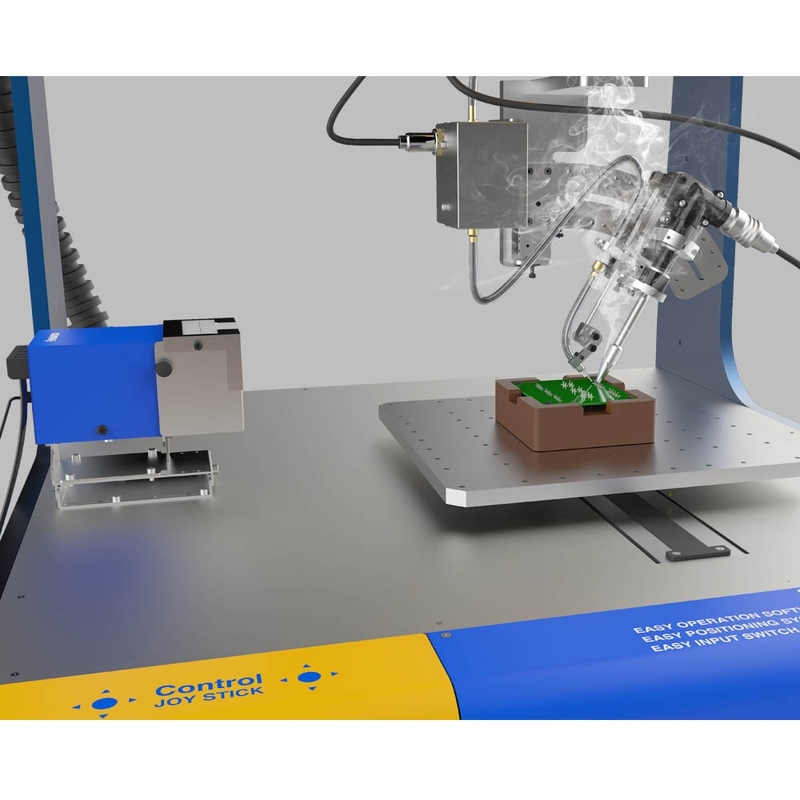 The HU-200 utilizes the power of the Hakko FU-601 Robotic Integration Soldering Module but integrates the communication of the Hakko FU-500 Feeder Controller directly into the robot. Additionally, the HU-200 also carries a feature for reading Gerber data. 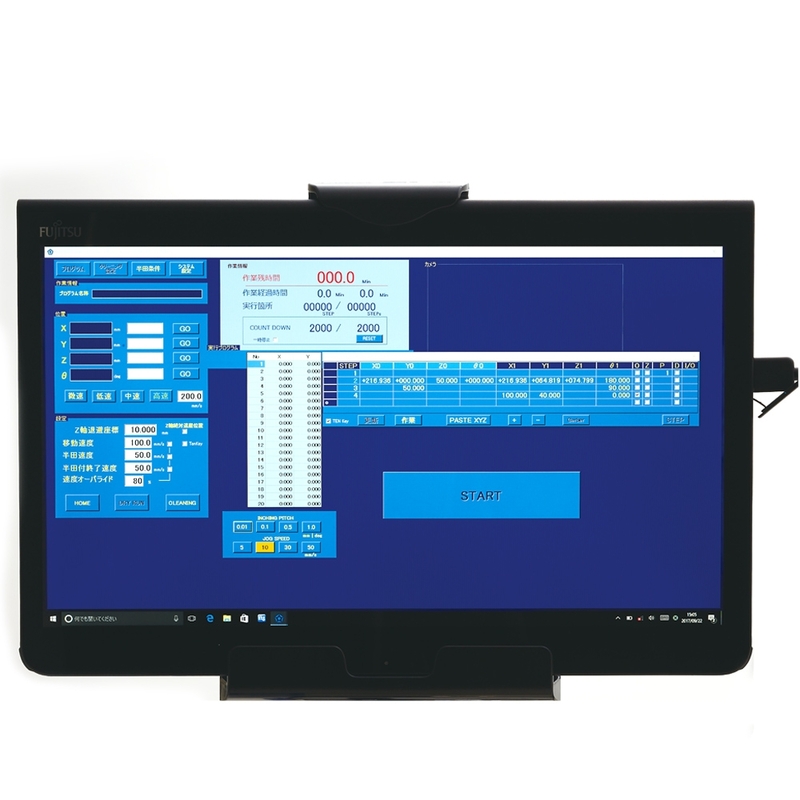 If a Gerber file is available, the file can be read by the HU-200 to locate and program the positions of the solder joints. TX1-XD, 140W Chisel Tip 1 x 12mm Tip for the FU-6001/FU-6002. TX1-XD08, 140W Chisel Tip 0.8 x 12mm Tip for the FU-6001/FU-6002. TX1-XD16, 140W Chisel Tip 1.6 x 12mm Tip for the FU-6001/FU-6002. TX1-XD24, 140W Chisel Tip 2.4 x 12mm Tip for the FU-6001/FU-6002. TX1-XD3, 140W Chisel Tip 3 x 12mm Tip for the FU-6001/FU-6002. TX1-XDR, 140W Chisel Tip 1 x 12mm, V-Groove Tip for the FU-6001/FU-6002. TX1-XDR16, 140W Chisel Tip 1.6 x 12mm, V-Groove Tip for the FU-6001/FU-6002. TX1-XDR24, 140W Chisel Tip 2.4 x 12mm, V-Groove Tip for the FU-6001/FU-6002. TX1-XDR3, 140W Chisel Tip 3 x 12mm, V-Groove Tip for the FU-6001/FU-6002. TX1-XRK, 140W Slot Tip 1mm/15° x 2.5 x 12mm Tip for the FU-6001/FU-6002. TX2-XBCR3, 300W Bevel Tip 3mm/15° x 17mm, V-Groove Tip for the FU-6001/FU-6002. TX2-XBCR6, 300W Bevel Tip 6mm/15° x 13mm, V-Groove Tip for the FU-6001/FU-6002. TX2-XD3, 300W Chisel Tip 3 x 17mm Tip for the FU-6001/FU-6002. TX2-XD4, 300W Chisel Tip 4 x 13mm Tip for the FU-6001/FU-6002. TX2-XD6, 300W Chisel Tip 6 x 13mm Tip for the FU-6001/FU-6002. TX2-XDR3, 300W Chisel Tip 3 x 17mm, V-Groove Tip for the FU-6001/FU-6002. TX2-XDR4, 300W Chisel Tip 4 x 13mm, V-Groove Tip for the FU-6001/FU-6002. TX2-XDR6, 300W Chisel Tip 6 x 13mm, V-Groove Tip for the FU-6001/FU-6002. TX2-XRK, 300W Slot Tip 2mm/15° x 3.6 x 13mm Tip for the FU-6001/FU-6002. BX1000 Solder Feed Pulley Unit Solder Feed Pulley Unit. BX1001 Solder Feed Pulley Unit Solder Feed Pulley Unit. BX1002 Solder Feed Pulley Unit Solder Feed Pulley Unit. BX1003 Solder Feed Pulley Unit Solder Feed Pulley Unit. BX1004 Solder Feed Pulley Unit Solder Feed Pulley Unit. BX1005 Solder Feed Pulley Unit Solder Feed Pulley Unit. BX1006 Solder Feed Pulley Unit Solder Feed Pulley Unit. BX1010 Teflon Tube 0.3mm Teflon Tube for use with the FU-500/HU-200. BX1011 Teflon Tube 0.5-0.6mm Teflon Tube for use with the FU-500/HU-200. BX1012 Teflon Tube 0.8mm Teflon Tube for use with the FU-500/HU-200. BX1013 Teflon Tube 1.0mm Teflon Tube for use with the FU-500/HU-200. BX1014 Teflon Tube 1.2mm Teflon Tube for use with the FU-500/HU-200. BX1015 Teflon Tube 1.6mm Teflon Tube for use with the FU-500/HU-200. BX1029 N2 Adapter N2 adapter assembly A.
BX1030 Assembly Nozzle Nozzle assembly D.
BX1031 Assembly Nozzle Nozzle assembly E.
BX1034 Iron Cable 8m Iron Cable. CX1002 Temperature Probe Robotic temperature probe. FA-430 Hose Clamp Two pack of hose clamps for the FA-430 Smoke and Fume Extraction System. A1567 Replacement Cleaning Brushes Replacement cleaning brushes for the FT-710 Tip Cleaner. BX1027 Flux Protector Flux protector. BX1028 Scatterproof Sheet Scatterproof Sheet. BX1033 Iron Cable 5m Iron Cable. BX1042 Tube Unit 1.2-1.6mm Tube unit. BX1043 Spring Post Spring post. BX1044 Tension Spring Tension spring. BX1056 Connecting Cable Connecting Cable. CX1003 Robotic Tip Cleaner Tip cleaner. CX5002, HU-200 Iron Base Iron fixing base for the HU-200. CX5017 Tip Adjustment Jig Tip Adjustment Jig Unit. CX5018 Tip Adjustment Jig Tip Adjustment Jig Unit. CX5019 Iron Mount Iron mount for FU-6001/FU-6002 hand-pieces. FU-6002 Soldering Handpiece Right-angled soldering handpiece for the FU-601 station / HU-200.